As mentioned, feazing is the present participle of feaze, which is a verb that means "to faze," which itself means "to disturb the composure of." In other words, to frighten or cause hesitation in someone. You've probably heard someone say "it doesn't faze him" or "she can't be fazed," which basically means that they can't be daunted or frightened. It's a pretty common word. Despite how common the word faze actually is, it's commonly spelled incorrectly as phase, which means something entirely different, generally referring to stages. This frequent misuse of faze vs. phase is regarded as one of the topmost confusing homophones, worse than base vs. bass and just as hard as principle vs. principal. It's even tricked the best of authors, from literary greats such as Mark Twain, to obscure frontiersman like R.B. Townshend, to prominent news publications, namely the BBC and New York Times. There are a few alternate definitions for feaze (or feeze) from Collins, one being a verb meaning "to beat," the other being a noun for "a rush." But if you're a sailor, you may recognize feazing and feezing as nautical nouns for "the unraveled portion at the end of a rope," which are commonly used more often with an added S, as feazings or feezings, or as verbs for "untwisting or unraveling the end of a rope." hatred and ridicule of grudging Red Sox fans. 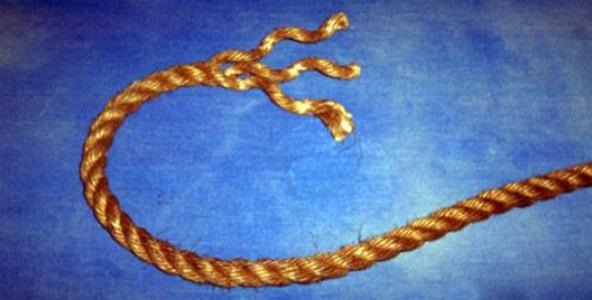 Unraveled ends of a rope, called feazings or feezings. So, just what is a Scrabble Bingo? A bingo is when a player empties his or her rack in one turn, placing all seven of their letters on the board to create a word that's at least seven letters long. The term "bingo" is used primarily in the U.S., but elsewhere it's simply known as a "bonus" because you get a bonus of 50 points added to your turn's score. "Scrabble Bingo of the Day" will focus on these high scoring plays, teaching you some interesting and possibly unusual seven-letter or longer words accepted in a game of Scrabble. Track future Bingo of the Days on Facebook or Twitter.